Mackenzie Allen Philips' youngest daughter, Missy, has been abducted during a family vacation and evidence that she may have been brutally murdered is found in an abandoned shack deep in the Oregon wilderness. 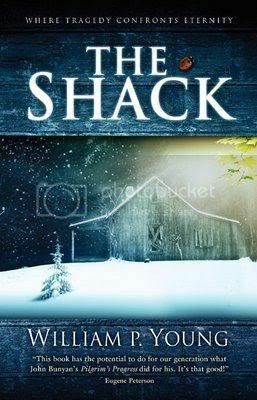 Four years later in the midst of his great sadness, Mack receives a suspicious note, apparently from God, inviting him back to that shack for a weekend. Against his better judgement he arrives at the shack on a wintry afternoon and walks back into his darkest nightmare. What he finds there will change Mack's world forever. I was really unsure about this one, and I still am to a certain degree. It's an incredibly religious text. I believe my reservations in that area may have something to do with me not fully enjoying the book, and they will certainly be a burden to me when attempting to review it. It really felt that rather than telling the reader a story here, the reader is to be taught a lesson about God, and about why he allows such pains and sufferings to take place in our world. The protagonist was a man who had turned his back on God after his youngest daughter had been abducted and killed. God then writes a note inviting our protagonist to the shack where the ordeal happened, in order to have a wee chat. Believable? The theological explanations which are given here are written in an extreme, poetic, Hallmark card fashion. There were times when my eyes began to glaze over due to an influx of biblical buzz words and motivational sentences. However, God is certainly presented as someone to think about. Young challenges our preconceived notions of God, and questions our judgements upon Him, and judgements upon our peers. Young is not a terribly good writer. Many times I noticed words which seemed to have been placed into a sentence by extreme use of a thesaurus. There were far too many adjectives, and a disturbing amount of similes. He is, however, a man who has gone through some ordeals in his life, spent a great deal of time evaluating these and trying to find God. I respect that. This book would be a better read for practising Christians, or indeed people with an interest in religion. It has certainly changed some of my perceptions of God, but it has absolutely not given me any sort of incentive to convert to Christianity, as the blurb and various reviews I read suggested it would. 31 / 72 books. 43% done!